I was rather taken with this history of blogging, being a cat lover myself - not a crazy Brigitte Bardot type dotty old bat with 50 rescued moggies doing a wall of death jumping from curtains to chair tops to kitchen work-surfaces to tiny window into the garden without once touching down paw to tile - having just the one, Ulysse. I haven't actually blogged about him much mainly because he keeps himself to himself so I don't see what he gets up to. I know he's the chef du quartier and sees off intruders without much injury, to himself at least. It's only now that the weather is getting cooler that he is deigning to spend more time in our company. Asleep. 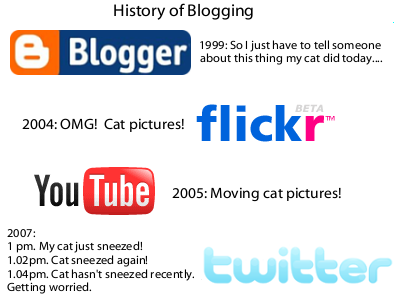 Funny how the History of Blogging sounds different if you replace 'cat' with 'dog'. It's just not the same. Is this what blogging boils down to really though? Telling cat tales? Ultimately, probably, yes. But you're getting into deep water if you ask 'what is the meaning of blogging? ', almost as much as if you ask 'what is the meaning of life?'. You can answer both with 'existence'. A blogger's desire to exist visibly - I blog online, therefore I am - is palpably linked to the point of his/her existence. If nobody sees you, are you really there? So, to celebrate the reaffirmation of my existence, for your pleasure and your joy, I offer you the latest cat cartoon from Simon's Cat. The ultimate in cat blogging.